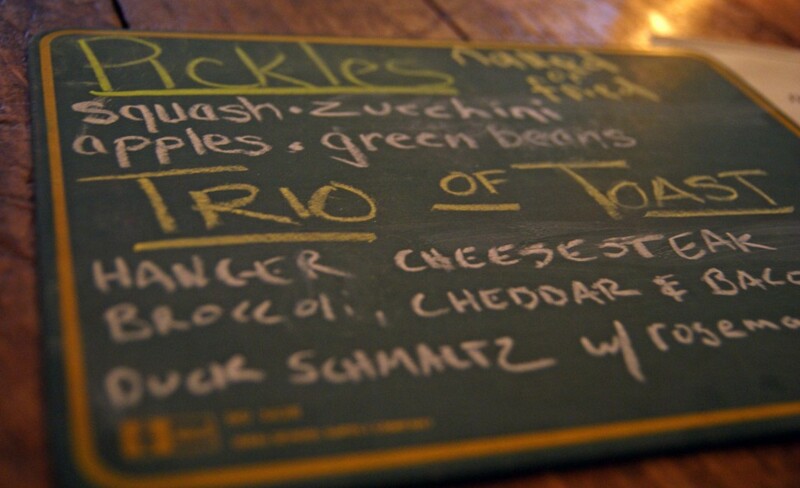 Another recent addition to the Cleveland dining scene is Toast, located in the Gordon Square district on the west side. Opened in the spring and headlined by a couple 20-something chefs, Toast continues the trend of sourcing local, seasonal, and fresh ingredients, and with a garden in the backyard, things don’t get much more local. Housed in a hundred year-old residence, it doesn’t have a lot in the way of decor, but the vintage/farm feel is evident with exposed brick in some of the walls, rustic wooden tables, and glass-front cabinets showing off some of the (presumably) house-canned goods. The menu is not the seven-page ordeal that you’d get at most chain restaurants – you’ll have about a half dozen options for each of the “Small Eats,” “A Bit More,” and “A Tad Larger” categories, most of which are coordinated to fit the season. 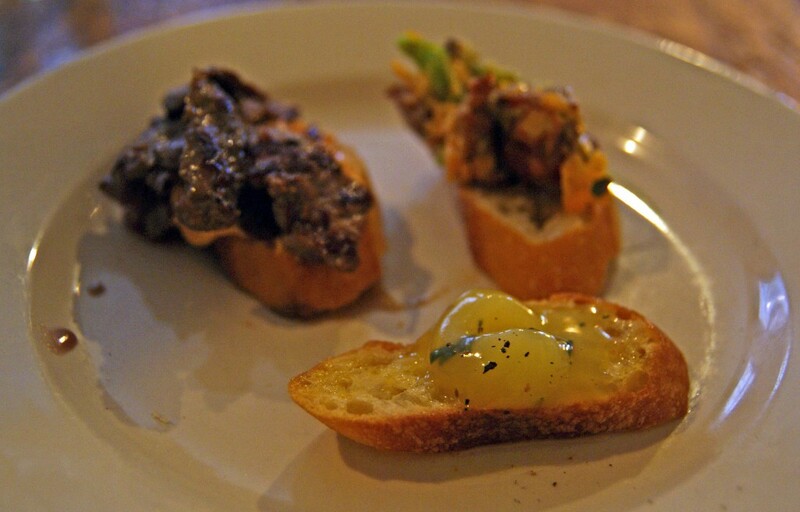 For starters, we tried the daily trio of toast – small crostini topped with hanger cheesesteak; broccoli, cheddar and bacon; and duck schmaltz with rosemary. The cheesesteak was probably our favorite, because it was a bit more substantial. Duck schmaltz (rendered fat) is kind of like a soft butter, but richer and (obviously) a little different flavor profile. And I love that at many places we visit, when they say “bacon,” they’re not referring to the wimpy slices you’d get at the store, but big, smoky bacon chunks. One note: the toasts were small and hard to cut/bite in half, so probably not recommended for sharing. For our “A Tad Larger” portions, we surprisingly both went veggie. 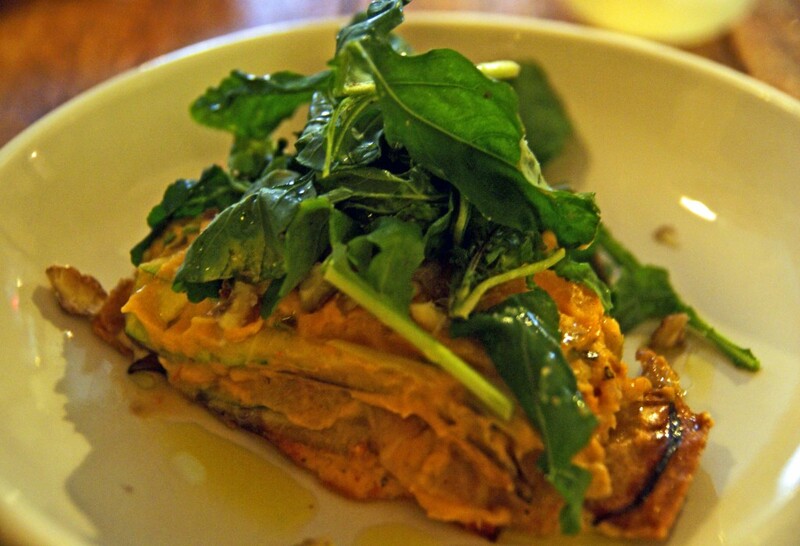 S had a lasagnette – basically a veggie lasagna, with thin-sliced “noodles” of eggplant and zucchini interspersed with the traditional pasta, thick slices of tomato, a “cream” sauce utilizing a cauliflower base, and all topped with fresh arugula. Very fresh and very flavorful, with herbs and chestnuts laced throughout. 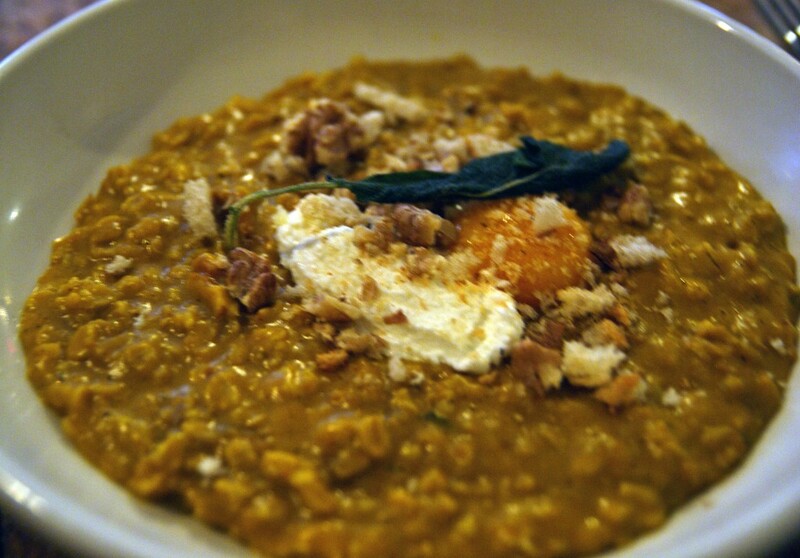 I had the pumpkin oats – their twist on risotto, made with… oats, in case you didn’t get it from the name. Creamy, mixed with butternut squash, sage, and walnuts, and topped with some fresh goat ricotta and a warm egg yolk, this could easily be eaten as a hearty breakfast, but was rich and savory enough to work as a dinner as well. Something different than my norm, but no regrets here. The verdict: Toast earns 5 1/2 stars out of 7. The food was all very good, prices are reasonable ($15-21 for entrees, though portions were a hair on the small size, particularly the toast trio), and our server was friendly and knowledgeable. A nice addition to the neighborhood, and I’ll be curious to keep an eye on the menu as it changes with the seasons.